While I don’t get asked very often what my favorite game of all time is, odds are, pretty damn close to the top, is Asura’s Wrath. While many have mixed feelings about QTE’s, I’ve never once cared, and Asura’s Wrath used them to great effect. As in, an extremely large chunk of the game is QTE’s, but they made Asura look like the certified badass that he’s supposed to be. 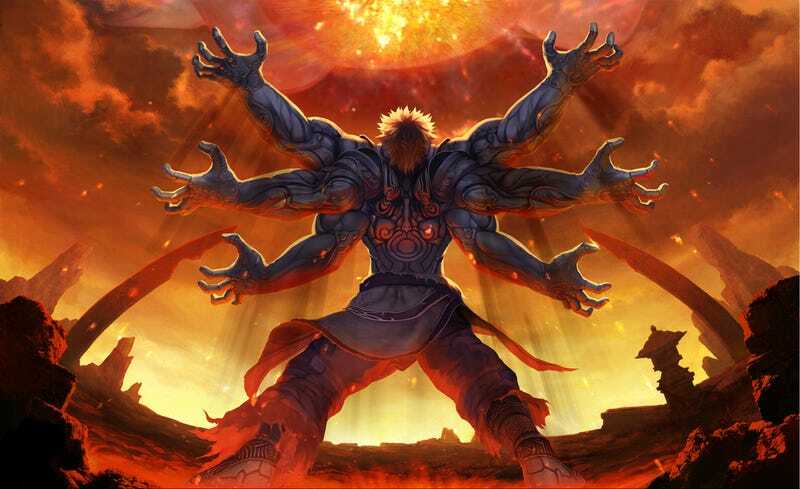 For those that didn’t dive into this game last generation, Asura’s Wrath follows the demi-god Asura who is framed for murder, his wife killed, and his daughter kidnapped by the people he once fought alongside, who all then proceed to kill him. However, he resurrects many centuries later as a destructive force of nature that proves to be nigh unstoppable. The story can easily be summarized as a father destroying everything in his wake in an attempt to rescue his daughter. I won’t lie, the base gameplay isn’t anything to write home about. You punch stuff until the game decides you’ve killed enough enemies to initiate the really good stuff, the QTE segments. And while hitting buttons when prompted may not sound like a lot of fun to you, it was for me. Every time I hit a button, someone happened that made it feel like that button press actually did something immediate rather than saying “Well, you pressed it, see what it did in a little bit.” And because the gameplay is mostly these QTE sections, you get a lot of really cool scenes that would fairly difficult, if not downright impossible, to pull off with standard gameplay. This approach made a lot of sense because these are supposed to be battles against literal gods and even the damn planet itself. The story of Asura’s Wrath has so much heart to it that it’s hard NOT to feel something by the end of it(Even if the true ending was DLC.). The journey is just so amazing that it completely overshadows the gameplay shortcomings. And that’s to say nothing of the soundtrack which is just plain amazing. I’ve had to of played through the game at least 5 times over the last 5 years, but at this point it’s becoming more and more of a pain to continuously pull out my PlayStation 3 to play it. Some may not like remasters, especially considering there have been so many of them this generation, but that won’t stop me from wishing that Asura’s Wrath would be ported to Unreal Engine 4(Fun fact: The game was built on Unreal Engine 3), given a facelift, and rereleased on Xbox One, PlayStation 4, and PC so that it would be easier for me and many others to relive this amazing game.